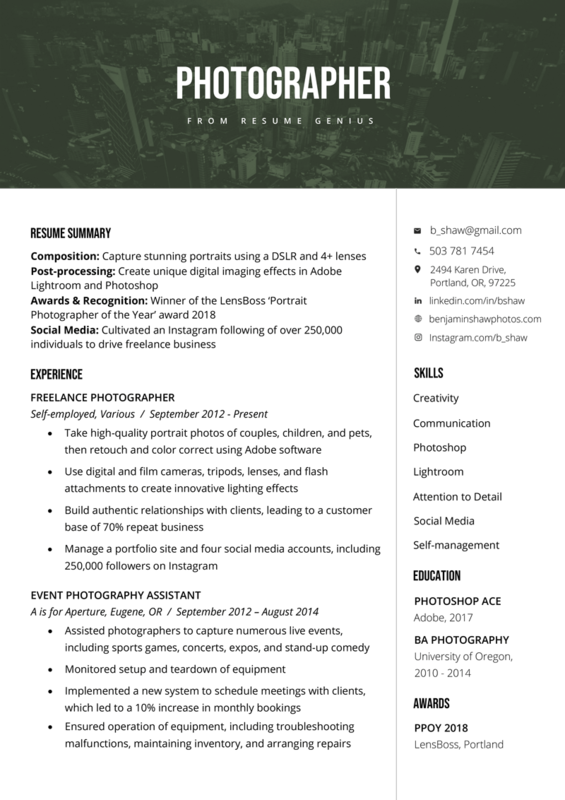 Looking for some creative ideas for your photographer resume? 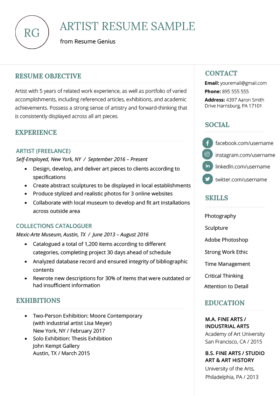 Our free downloadable photographer resume sample and writing tips will help you land more lucrative freelance gigs and in-house contracts. 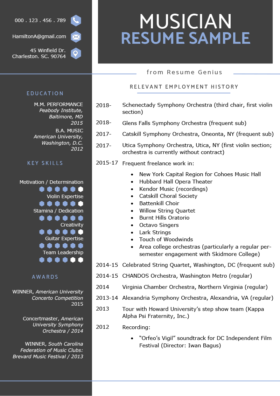 If this resume doesn't inspire you, check out our full library of resume templates. Being a professional photographer is a dream job for many people. If you have an eye for capturing the world around you and know how to market your creative skills, there are plenty of opportunities to forge your own career path. Some photographers work in-house for studios, whereas others choose to be self-employed. According to the Bureau of Labor Statistics, salaried jobs will soon become more difficult to find as companies offer more contracts to freelancers. That means it’s now more important than ever to have a top photographer resume. Use these tried and true tips to create an application that is as striking as your best images. It’s a fine line – your photographer resume needs to showcase your creative side, but it shouldn’t venture too far from the three established resume formats standard across most industries. First, he uses a modern resume template with a large image header that sets a visual tone for the entire document. The background highlights his name and therefore his brand – making sure it sticks in the hiring manager’s mind. By using a two-column format, our candidate’s contact details are presented clearly in the top right corner. Instead of just including his basic information, he also adds his LinkedIn profile, photography portfolio, and Instagram. Your photography resume should look the part, but don’t sacrifice professionalism for unnecessary design touches. Candidates in most industries (including photography) should avoid adding personal social media links. However, our particular applicant built a large Instagram following to drive his business, making it a valuable addition to his freelance photographer resume. Finally, his resume is rounded off with a traditional skills section that includes a mix of hard and soft skills, an education section, and an awards section. While the resume content is kept strictly formal, our candidate’s portfolio can act as an online supplement and include anything – from the best examples of his work to a list of notable clients. Remember: Your photography resume should look the part, but don’t sacrifice professionalism for unnecessary design touches. We have a huge selection of free downloadable resume templates ready for your personalize. Your experience section is the foundation of your resume. It presents an opportunity to give the hiring manager a clear and accurate snapshot of your career and achievements. Action verbs give your job descriptions more character. Starting an experience bullet point with a strategic action verb shows that you have initiative – a trait photographers need to get the best gigs. Can’t think of great ones for your own application? Check out the longest list of action verbs in the universe to find the vocabulary you need to make the most impact. Employers love it when you measure your wins with numbers, timeframes, percentages, and dollars because it shows exactly what you can offer their company. Tell the truth, of course – but don’t be modest about your accomplishments. Implemented a new system to schedule meetings with clients, which led to a 10% increase in monthly bookings. By following these three simple steps, the content of your photographer resume will already be miles ahead of the competition. Looking for more insider advice like this? We compiled all the best resume tips from our career experts and put them all in one comprehensive list. Your resume introduction is the first thing a hiring manager will read. This is your elevator pitch, so it’s vital to get it right and make a positive first impression. Our candidate doesn’t use any of these, however. He has a secret weapon – his resume begins with a concise resume summary. Resume summaries replace lengthy statements with subheadings that give the reader immediate insight into your strengths. They also provide evidence that you can deliver results. Each subheading is one of your key competencies. These are then backed up with an example of when you used the skill before, plus the result. Think of it like composing a photograph – symmetry and framing are used to capture the eye. Choose the introduction format that is right for you and you’re off to a running start. Why are resume introductions so important? Because hiring managers reportedly judge a resume in only 6 seconds and decide whether to keep it, or bin it. Finally, pair it with a matching cover letter template and get ready for the interviews to start rolling in. To help you get started, we have an extensive library of resume templates that are free to download. Or, if you want to be even more confident in your application, our free and recently improved resume builder will create the perfect photographer resume in minutes. Feel free to leave a comment below if you have any questions – we’re here to help!